We’re very egg-cited with the glorious, spring days! 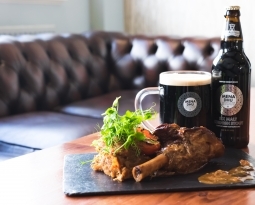 Here’s one more way with eggs at Easter – a recipe from Prosenjit Sanjay Kumar from the County Arms in Truro for a crisp, Cornish hog’s pudding served with Tribute Ale mustard. Sanjay says that this dish brought back memories of ‘Nargisi Kofta’, a Kashmiri-India dish of spiced, minced lamb coated eggs in a curry sauce that was popular in the royal courts of the sub-continent. 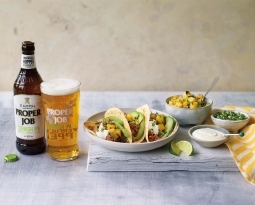 It’s great as a starter or in a picnic basket, and washed down with a refreshing, chilled pint of Korev. Put 4 eggs into a pan of cold water and gently bring to the boil. Boil for 3 to 4 minutes, then transfer to a bowl of cold water. Once cooled, carefully peel them (I find it easier to peel boiled eggs under running water). Put the sausage meat into a bowl with chopped hog’s pudding, mustard and a good pinch of salt and pepper. Mix thoroughly and divide into 8 balls. Have three bowls ready with flour, beaten eggs and bread crumbs. To make the Scotch eggs, start by flouring your hands. In the palm of one hand, flatten one of the sausage balls into an oval-shape. Roll a peeled egg in flour, then pop it in the middle of the flattened sausage meat. Gently shape the meat evenly around the egg, moulding it with your hands. Heat the oil in a deep pan or deep fat fryer to about 150ºC/300ºF. Carefully lower the eggs into the pan and cook for about 4-6 minutes, turning them until golden and the sausage meat is cooked. 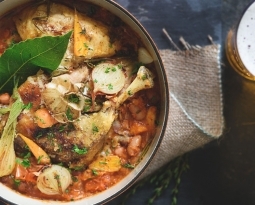 Remove with a slotted spoon and drain on kitchen paper. 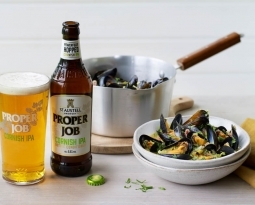 For the beer mustard: Whisk 15 ml of tribute ale into 30 ml of grain mustard and keep aside. 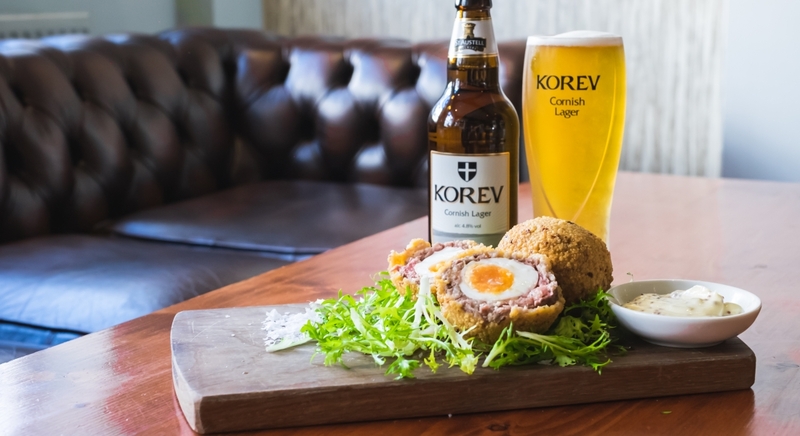 Serve the Scotch egg hot or cold with crushed sea salt, dollops of Tribute beer mustard and a pint of Korev Lager.